Semi Automatic AC Recycling Machine that we offer is manufactured by keeping in mind the convenience and ease-of-operation factors for the users. The Semi Automatic AC Recycling Machine features an LCD display, a user-friendly operation interface and it’s easy to operate. The Semi Automatic AC Recycling Machine offers multiple functionalities like recovery, recycle, evacuate, recharge, leakage test. 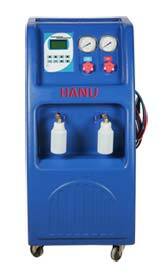 Multifunction: recovery, recycle, evacuate, recharge, leakage test.